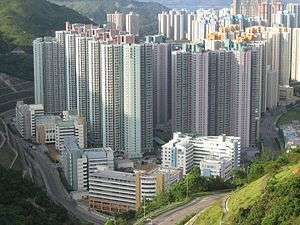 A typical public housing complex in Tseung Kwan O, Hong Kong. The Kin Ming Estate consists of 10 housing blocks, providing affordable housing for approximately 22,000 people. Nearly half of Hong Kong's 7.8 million population lives in public housing. 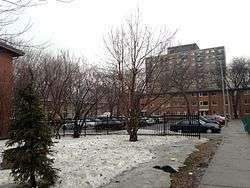 In Canada, public housing is usually a block of purpose-built subsidized housing operated by a government agency, often simply referred to as community housing, with easier-to-manage town houses. Canada, especially Toronto, still maintains large high-rise clustered developments in working-class neighborhoods, a system that has fallen into disfavour in both the UK and US. 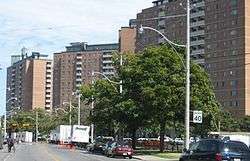 However, Toronto Community Housing, the second largest public housing agency in North America, has a variety of buildings and communities ranging from individual houses to townhouse communities and mid-rise and high-rise apartments in both working-class and middle-class neighborhoods. They house low-income Canadians. In 2014, the City of Vancouver, long considered one of the least affordable cities in the world, changed the definition of social housing to mean rental housing in which only 30 percent of dwelling units need to be occupied by households that don't have the income to be able to pay market rents. At the end of the Second World War, enriched by US investments and an oil boom, Mexico had its first demographic boom, in which the primary destination for rural immigrants was Mexico City. Mario Pani Darqui, a famous architect at time, was charged to build its first big scale projects. Built for the Dirección de Pensiones Civiles y Retiro (the National Pensions office, today ISSSTE), the Centro Urbano (or Multifamiliar) Miguel Alemán (1947–50) and the Centro Urbano (or Multifamiliar) Benito Juárez (1951–52), both in the Colonia Roma, introduced formal ideas from Le Corbusier's Ville Radieuse into the urban fabric. 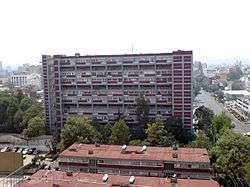 But after all, Mexico has had experience of housing projects since Porfirio Díaz's regime, one of those, still remains and is the Barrio of Loreto in San Ángel, Álvaro Obregón, D.F., that was a project for a paper factory workers. 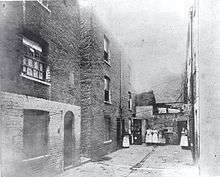 In the nineteenth and early twentieth centuries, government involvement in housing for the poor was chiefly in the introduction of buildings standards. 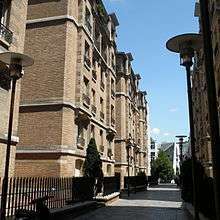 New York City's First Houses, dedicated in 1935, were the nation's first public housing project. 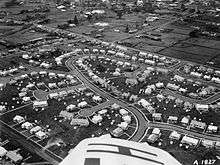 Most housing communities were developed from the 1930s onward and initial public housing was largely slum clearance, with the requirement insisted upon by private builders that for every unit of public housing constructed, a unit of private housing would be demolished. There are also many New York City Housing Authority (NYCHA) efforts that have provided in-demand and inexpensive public housing for decades, see "Public Housing That Worked: New York in the Twentieth Century" by Nicholas Dagen Bloom for a rigorous examination of the U.S. public housing management agency with the country's most extensive holdings. Bloom's "Public Housing" dispels common U.S. public housing myths while detailing advances made by NYCHA, see also NYCHA's own website "Fact Sheet" for elucidation of the magnitude and scope of their work since 1934. In mainland China, the government provides public housing through various sources, such as new housing, abandoned properties, and old flats which are rented at a low price and called 'Lian Zu Fang' (literally 'low-rent house' or 'low-rent housing', Chinese: 廉租房). Additional housing is built by providing free land and exemption from fees to estate developers: the resulting houses are called 'Jing Ji Shi Yong Fang' (literally 'the economically applicable housing', Chinese: 经济适用房). The concept of the low-cost rental housing can be traced to a 1998 policy statement, but did not truly take off until 2006 due to limited funding and administrative problems. The provision of more affordable housing is one of the key components of China's Twelfth Five-year Plan, which targets the construction of 36 million homes by 2015. That program's costs will be split between the private and public sector and are estimated at five trillion yuan by Chinese investment bank CICC. In Hong Kong, public housing is one of the major housing policies of the government. Nearly half of Hong Kong's 7.8 million population lives in public housing. Public housing was an important issue right from the foundation of the Republic of German-Austria in 1918. The population was faced with a great deal of uncertainty particularly as regards food and fuel. This led to a significant number of less affluent people to move to the perifery of towns, often building makeshift homes to be closer to where they could grow food. They were called Siedler (settlers). As the political situation became stabilised with foundation of the First Austrian Republic in September 1919, the Siedler movement started creating formal organizations like the Austrian Association for Settlements and Small Gardens. The electoral victory of the Social Democratic Party of Austria in the elections for the Viennese Gemeinderat (city parliament) gave rise to Red Vienna. Part of their programme was the provision of decent homes for the Viennese working class who made up the core of their supporters. Hence the German word Gemeindebau (plural: Gemeindebauten) for "municipality building". In Austria, it refers to residential buildings erected by a municipality, usually to provide low-cost public housing. These have been an important part of the architecture and culture of Vienna since the 1920s. In Denmark, public housing is called Almennyttigt Boligbyggeri and is owned and administered by app. 700 self-governing, democratic and non-profit organizations by and for the tenants themselves. Many of the public housing organizations in Denmark are rooted in the early history of the labor unions and currently forms about 20% of the total housing stock with c. 7.500 departments countrywide. A membership of a housing organization is usually required to obtain a rental and they are granted with regard to length of membership. Although the buildings are owned and administered by self-governing and economically independent organizations, the State of Denmark is strongly regulating public housing in the country. By law, the municipalities have access to 25% of the rentals, usually reserving them for the poor, the unemployed, the disabled or mentally ill or any other group dependent on social benefits from the municipality. Over the years, these regulations has created many 'especially vulnerable residential areas' – socalled "ghettos" – within the country. The Danish Public Housing has never had any income restrictions, but in recent years new state regulations has made it mandatory for several of them to favor fully employed renters and disfavor unemployed or part-time employed people. This is a relatively new effort by the state to counter the ghettofication, which is now an officially recognized problem countrywide. 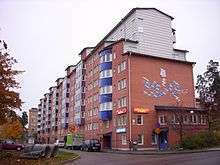 As in Sweden, state and municipal policies carried out throughout the first decade of the 21st century, has led to an increased privatization of public housing. In many areas, residents have been offered to buy their own flats, thereby effectively changing the status of the property. The privatization of public housing was initiated as part of an ideological program by the right wing governments of the early 21st century and was launched a few years after the closure of the former Ministry of Housing Affairs in 2001. The former ministry was re-opened as Ministry of Housing, Urban and Rural Affairs in October 2011, when a new coallition government led by social-democrats was formed. It is incorrect to refer to French social housing as public housing. The origins of French social housing lie in the private sector, with the first State aid provided to limited-profit companies by the loi Siegfried in 1793. The originally socialist idea was promoted by some French employers in the 2nd half of the 19th century. Public housing companies followed before the Great War. There are still different social housing movements, public, private and some cooperative. Social landlord organizations all have similar regulation and similar access to government loans but there are significant differences<Much is found in the Code de la Construction et de l'Habitation (the Building and Housing Code), Book IV (with social housing allocation and funding elsewhere in the Code). The original objective of these organizations was to provide homes for purchase by installments and about one third of their construction is still for purchase. There are a great many statistics and information about current access and funding on the Ministry of Housing Website: http://www.territoires.gouv.fr/logement-et-hebergement for access. There are now also a number of joint venture public-private companies. While they succeeded in giving lower-income families a place to live in the drive to provide popular housing, this system also led to the creation of suburban ghettos, with a problem of disrepair. There has been a long-term problem of gradual impoverishment of social tenants There, deprived strata of the population, mostly of immigrant origin and suffering massive under-employment, might in the past have been left to simmer away from the more affluent urban centres, sometimes becoming rife with social tensions and violence. 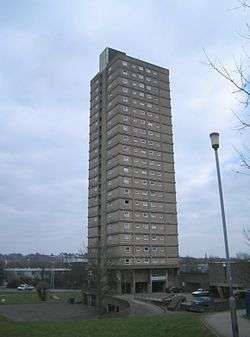 This affects a minority of social housing but has a high profile and still produces serous tension. Between 1925 and 1930 Germany was the site of innovative and extensive municipal public housing projects, mostly in Berlin, Hamburg, Cologne and Frankfurt am Main. These Siedlungen (settlements), were made necessary by the dreadful living conditions of pre-war urban tenements. The right to a healthy dwelling was written into the 1919 Weimar Constitution, but few dwellings were built until economic stability in 1925. These settlements were low-rise, no more than 5 stories, and in suburban settings. Residents were provided access to light, air, and sun. 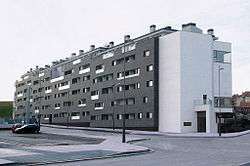 The size, shape, orientation and architectural style of Germany's public housing were informed by the recent experience of the Vienese and the Dutch, the anti-urban Garden City Movement in Britain, by new industrialized mass-production and pre-fabrication building techniques, by the novel use of steel and glass, and by the progressive-liberal policies of the Social Democrats. Architect Martin Wagner (with Bruno Taut) was responsible for the thousands of dwellings built in and around Berlin, including the Horseshoe Siedlung (named for its shape), and Uncle Tom's Cabin Siedlung (named for a local restaurant). But Wagner was second to the city planner Ernst May in Frankfurt. May was responsible for the construction of 23 separate settlements, 15,000 total units, in five years. He ran his own sizable research facility to investigate, for instance, air-flow in various floorplan configurations, construction techniques, etc. The Austrian architect Margarete Schütte-Lihotzky applied the principles of Taylorism to the kitchen workspace and developed the Frankfurt kitchen while working for Ernst May. Beyond technical research May also published two magazines and embarked on a significant public-relations project, with films and classes and public exhibitions, to make Neues Bauen acceptable to the public. In the late 1920s the principles of equal access to "Licht, Luft und Sonne" (light, air and sun) and the social effects of a guaranteed "Existenzminimum" became a matter of lively popular debate all over Germany. One indirect result of this publicity was the American housing movement: a young Catherine Bauer attended one of May's conferences in 1930, and wrote her seminal "Modern Housing" based on research done in Frankfurt and with Dutch architect JJP Oud. In East Germany, Communist administration saw the rise of the Plattenbau ("panel building"). Virtually all new residential buildings since the 1960s were built in this style, as it was a quick and relatively cheap way to solve the country's severe housing shortage, which had been caused by wartime bombing raids and the large influx of German refugees from further east. 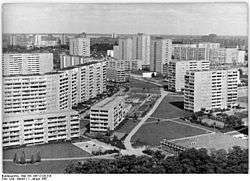 There were several common plattenbau designs. The most common series was the P2, followed by the WBS 70. the WHH GT 18, and Q3A. The designs were flexible and could be built as towers or rows of apartments of various heights. Panelház (short form: panel) is the name of a type of block of flats (panel buildings) in Hungary. 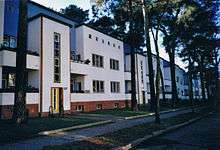 It was the main housing type built in the Socialist era. 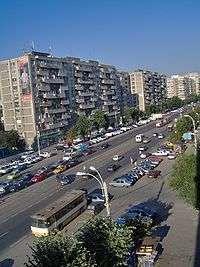 From 1959 to 1990 788,000 panel flats were built in Hungary. About 2 million people, about one fifth of the country's total population, live in these flats. The Hungarian and local municipalities began a renovation program during the 2000s. In the program they have insulated these buildings, replaced the old doors and windows with multi-layer thermo glass, renewed the heating system and colored the buildings in a more pleasant way. Public housing, winner of an environmental design award, in El Astillero (Cantabria), Spain. Rebuilt Million Programme homes in Rinkeby (2009). In 1937 the First Labour Government launched a major public-housing system - it became known as "state housing" - for citizens unable to afford private rents. Most state housing built between 1937 and the mid-1950s consisted of detached 2-to-3-bedroom cottage-style houses; only 1.5% of state houses in 1949 formed part of apartment blocks, all of them in Auckland or in greater Wellington. After World War II ended in 1945, most local authorities also started providing social housing, mainly for elderly people with low incomes. 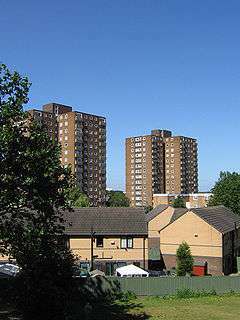 Wikimedia Commons has media related to Public housing. 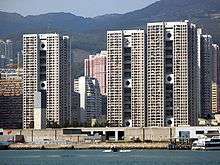 1 2 Hong Kong Census and Statistics Department – Population by type of housing The government provides public housing through flats which are rented at a lower price than the markets, and through the Home Ownership Scheme, which are sold at a lower price. These are built and administered by the Hong Kong Housing Authority and the Hong Kong Housing Society. ↑ "Bethnal Green: Building and Social Conditions from 1837 to 1875". A History of the County of Middlesex: Volume 11: Stepney, Bethnal Green. 1998. pp. 120–126. Retrieved 14 November 2006. ↑ "BOUNDARY OF OLD NICHOL'S VICE, FILTH & DEATH". ↑ "To Check the Survival of the Unfit". The London. 12 March 1896. Retrieved 13 November 2006. ↑ "A History of the County of Middlesex: Volume 11: Stepney, Bethnal Green". 1998. pp. 126–132. Retrieved 14 November 2006. 1 2 Hollow, Matthew (2011). "Suburban Ideals on England's Interwar Council Estates". Retrieved 29 December 2012. ↑ O'Brien, Frank (21 January 2015). "Vancouver second-least affordable city in group of nine developed countries for at least fourth straight year". Business in Vancouver. Retrieved 15 March 2015. ↑ Pablo, Carlito (18 March 2015). "City of Vancouver revisits definition of social housing". Georgia Straight. Retrieved 18 March 2015. ↑ "New York City Housing Authority". The City of New York. Retrieved 16 November 2011. Dedication ceremonies for First Houses, December 3, 1935 – First Lady Eleanor Roosevelt cuts the ceremonial ribbon at the landmark opening of the first public housing development in the United States. ↑ "HUDNo.10-112/U.S. Department of Housing and Urban Development (HUD):". HUD. June 2010. Retrieved 16 November 2011. ↑ Sun Jianfang (24 October 2011) Will Housing Projects Boost GDP? The Economic Observer Quarterly. Retrieved 9 December 2011. ↑ Vossoughian, Nader (2008). Otto Neurath: The Language of the Global Polis. The Hague: NAi. ISBN 978-90-5662-350-0. 1 2 "Fact sheet on the Danish social housing sector" (PDF). Ministry of Housing, Urban and Rural Affairs. Retrieved 28 May 2015. 1 2 "Almenboligloven [Law on Public Housing]". retsinformation.dk (in Danish). The Department of Civil Affairs. 24 August 2013. Retrieved 28 May 2015. ↑ The Ministry of Housing and Urban Affairs had been in operation for more than 50 years, from 1947–2001. ↑ "Ministry of Housing, Urban and Rural Affairs". Ministry of Housing, Urban and Rural Affairs. 29 April 2015. Retrieved 28 May 2015. ↑ Hans Kristensen (2 July 2005). "Present and Future Housing Problems in Denmark – and predictable Changes in Housing Policy". Center for Housing and Welfare. Retrieved 28 May 2015. ↑ "Quelques données chiffrées sur le parc locatif privé [fr]"
↑ "General information on various student flats and building types in Budapest". Budapest Corner. Retrieved 11 December 2010. ↑ "27/01 Rent influencing regime – implementing the rent restructuring framework". Housing Corporation. 22 October 2001. Archived from the original on 23 January 2009. Retrieved 19 December 2012. ↑ "Housing association homes". GOV.UK. Retrieved 19 December 2012. ↑ Housing. "Choice-Based Lettings". Content under review. Archived from the original on 27 June 2008. Retrieved 14 September 2010. ↑ Housing. "Local authority strategic housing role". Content under review. Archived from the original on 28 March 2008. Retrieved 14 September 2010. ↑ "Response Paper". Chartered Institute of Housing. 1999. Retrieved 14 September 2010. ↑ Lorna Duckworth (9 April 2002). "Council tenants vote against housing transfer plans". Social Affairs Correspondent. The Independent. Retrieved 14 September 2010. ↑ "Housing inspections". Retrieved 14 September 2010. ↑ For example: Ross, Robert (1843). "Letter from Robert Ross". Letters from Settlers & Labouring Emigrants in the New Zealand Company's Settlements of Wellington, Nelson, & New Plymouth: From February, 1842, to January, 1843. London: Smith, Elder and Company. p. 121. Retrieved 2015-09-30. There were then [in February 1842] no houses [in Nelson] excepting the Company's offices and immigration barracks; but now [November 1842] there are about 1000 [...]. ↑ Roche, Michael (2010). "Building Houses in New Zealand under the Workers' Dwelling Act, 1905 and Housing Act, 1919". In Nichols, David; Hurlimann, Anna; Mouat, Clare. Green Fields, Brown Fields, New Fields: Proceedings of the 10th Australasian Urban History / Planning History Conference, University of Melbourne, 7-10 February 2010. Melbourne, Australia: University of Melbourne. p. 530. ISBN 9781921775079. Retrieved 2015-09-30. [...] only 646 houses were ever built under the act, far short of the initial target of 5000 [...].